The Library will have extended hours for final exams Sunday, December 7th – Friday, December 12th. 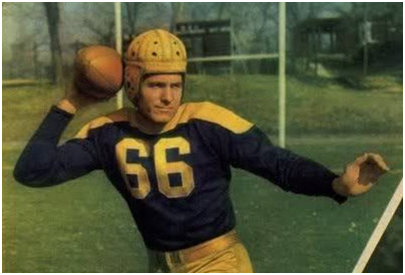 12:30 p.m. – 3:00 a.m.
Arnie Herber was quarterback for the 1929 Regis football team. When Regis stopped the football program because of the stock market crash, he moved back to his hometown of Green Bay, Wisconsin, to work as a handyman in the Packer’s clubhouse. Despite being given the nickname “dummy” by the squad, Coach Lambeau gave him a tryout and then signed the 20 year old for $75 per game. Herber went on to lead the Green Bay Packers to four league titles as one of the NFL’s finest passers. His nickname was soon changed to “The Kid” and then “Flash.” He played eleven years for the Packers and was inducted into the NFL Hall of Fame in 1966. Thanks to a Regis neighbor, a sports fan and regular user of our Library, now we know. The library will have modified hours for the Thanksgiving holiday and for Winter Break. Wednesday, November 26: 7:30 a.m. – 6:00 p.m.
Our Chat with a Librarian 24/7 service will be closed on November 27, December 25, and January 1. Regular hours resume Monday, January 5. You are currently browsing the Regis University Library news blog archives for November, 2014.